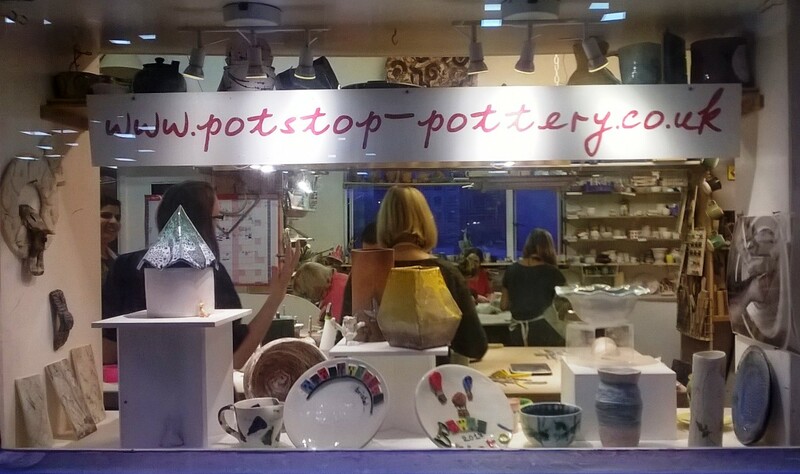 On a central street in Bristol a group of people are participating in a ceramics class at Potstop Pottery. The time is around 8pm, I am passing by, the glow from the window and movement of activity inside catches my attention. It looks busy, there are lots of pots and ceramics in the window on display, people in the background making were the things I noticed, without lingering other than to take a quick photo of the name of the place on my phone. It looked fun, understated and genuine; for reasons that will soon become clear, it felt poignant given from where I had been a few minutes earlier. 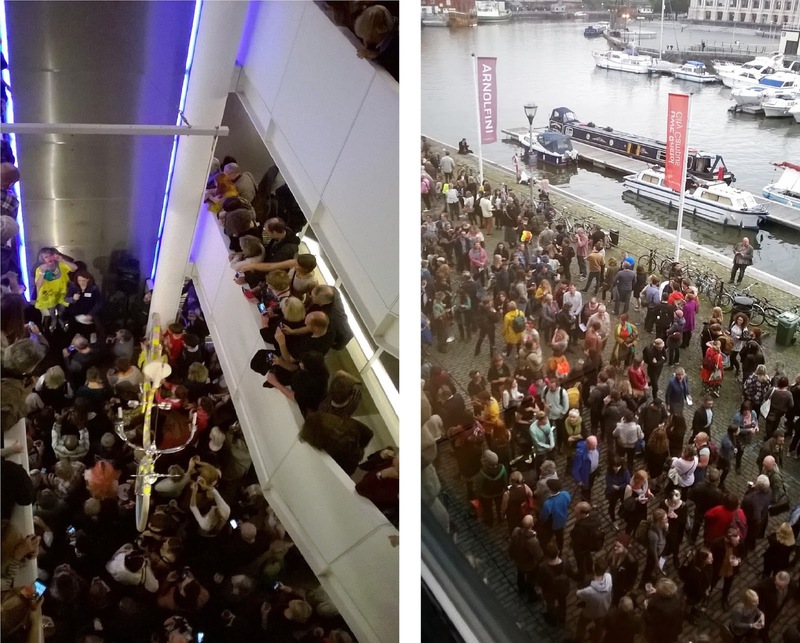 A hundred yards away I had just emerged from the crowds of people who were still waiting in a queue that is still four-people deep outside the Arnolfini, all waiting their turn, as I had, to enter the self-prophetically titled, ‘Most Popular Exhibition Ever!’ from artist turned celebrity, Grayson Perry. Only in retrospect, as I now walked past this real-life pottery lesson taking place before my very art weary eyes did I truly appreciate the irony of queueing to see ceramics displaying ‘British-ness’ when the real thing was happening in a slightly different form a matter of metres away. This raises several debates but particularly on how museums and galleries programme their exhibitions and whether measuring success and quality based on popularity is as hard to define as it is potentially troublesome. However, I have never looked at the reasons why people visit or not art galleries and can only assume that those entrusted with the precarious task of filling these spaces programme exhibitions based on a balance and not fall into labels of marketing whereby an exhibition is popular as to another that be deemed challenging. Most exhibitions fall into multiple if not hazy realms of categorisation. I do not have the answers and neither does Grayson Perry it seems, but what I do admire him for is his ability to articulate issues within the arts and put forward questions and issues that we should think about, if not challenge because he seems for an appreciation of art that is not passive even if it is 'popular'. For an artist that continues to explore both his own and the nation’s identity, Perry has either unwittingly or cleverly almost marketed himself as his transgender alter-ego, Clare; or the man in the dress that makes pots. These identities that were once part of the challenging and exploration of what Grayson Perry’s art is about [identity, perception, surfaces] have since become ‘accepted’ and familiar so it becomes an interesting contrast and dilemma of what happens when the outsider is no longer outside?! My friend gave the analogy of anti-establishment American punk band Green Day becoming so popular that, that they aren’t quite punk anymore. Maybe in being popular, Perry and Green Day can reach a wider audience with the brand of unconformity or rebellion that they are selling, but on the negative side, maybe it also gets diluted and becomes acceptably-edgy rather than maintaining its power to cause affect through shock. This sentiment best echoed in the context of having this exhibition in Bristol as its first place to be shown outside of London is telling of the city’s relationship with graffiti art and the similar dichotomy of the ‘political made popular’ with work made by Banksy whose exhibitions at Weston’s Tropicana and Bristol Museum were arguably, at least in terms of visitor numbers, amongst the most popular exhibitions in the area in the last decade! An exhibition with this amount of hype comes with a huge amount of expectation and we are welcomed on the first floor with works which explore, ‘what makes a man’. A tapestry made in response to the ceremony of the blessing of the banners with Durham Miners as part of a Channel Four programme on different social-class tribes, traditions and how these factors shape a sense of communal identity. 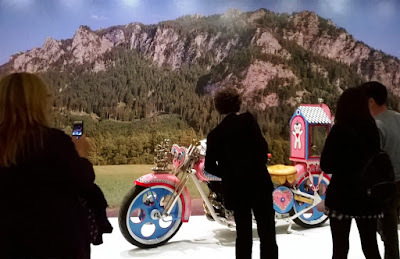 It also includes Perry’s custom-made motorcycle in pink and blue with its own Popemobile style box for Alan Measles (his teddy bear). The symbolism of what masculinity is thrown away from perceived stereotypes with the inclusion of words such as, humility, patience and chastity. In the upstairs galleries the theme of identity continues with an exploration of ‘Britishness’ and the ‘tribes’ of Britain exploring the impact of Brexit amongst other social and political issues. 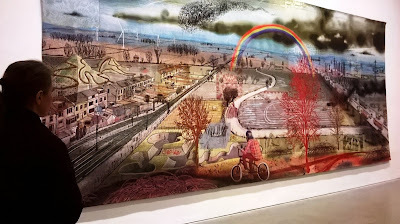 I would speculate that one of the reasons that this exhibition and Grayson Perry are so popular is because he makes art that engages and is interested in people and what they have to say. Who doesn’t want to be listened to? A huge positive that both the public and people in power should draw from Perry’s work, is the benefit of integrating arts more into society as a way of engaging discussion and providing a voice on issues in a way that has a high profile but allows people to express their views more openly because it does not conform with the usual systems of government. I am conscious that I have written little on the actual work and content of this exhibition, as there is a LOT in it, but I feel somewhat fatigued with seeing these works again; their message already written or spoken much about on their corresponding televised documentaries. One pot represents the Brexit voters the other the remainers; both unremarkably similar. I am now more interested in the phenomenon of the show as a whole, why it is popular and what implications, opportunities or indeed threats does that place to art, artists, the public and galleries etc. 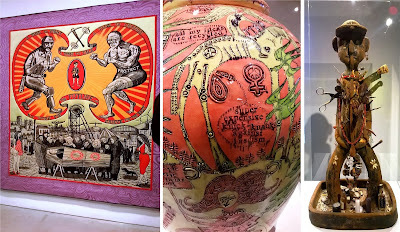 For example, I would be interested in Grayson Perry using his ‘celebrity’ to empower people as an artist to make their own art/images/pots in response to the issues he raises rather than documenting them as is the formula he has begun to adopt. The problem with trying to do something that is popular or appeals to everyone is that in trying to be everything to everyone the result ends up ultimately, being about nothing. Who is 'everyone' anyway? I think we are all so different that it is almost impossible (surely) to make work that appeals to all. Art work and curation of galleries should never panda to a market-driven sense of taste or inclusiveness, quite the opposite; they should feel more empowered to create new discussions, trends, topics. As another analogy; I enjoy visiting museums and looking at entomology collections and dinosaur skeletons, it doesn’t mean I know or even need to know much or anything about them in order to appreciate them. 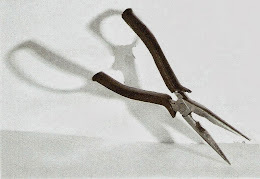 My reasons for visiting are driven out of curiosity, something to do and experience, wanting to learn or be challenged. Our relationship with art and art galleries is always so much more confrontational and met with a different set of expectations different but irrespective of everyone’s personal experience. I think that educationally we do need to do more to teach how to read visual language and not just how to make it and galleries need to take their own responsibility at always adapting to get better at inspiring, promoting, enthusing, articulating and creating reasons why people should go and see/experience art. Easier said than done! 'Battle of Britain' 2017 Tapestry 302.7 x 701cm. As I leave the crowds I wonder, how memorable individual works in this exhibition will be in twenty, fifty, a hundred years time? In what way will we be talking about them and how does this compare to works that were deemed ‘unpopular’ in their own time and have since become significantly valued or culturally important? The saving feature of Perry’s work is that the production and craft that goes into producing them has a hand-made sense of integrity that will ensure their preservation in stopping these pieces becoming quick one-liners. Though I feel that the increasing appeal is not through what Perry makes but what he says, writes and his interaction with the people who visit galleries (or not) and the institutions of art itself [the gallery, the art school, the museum etc.]. These are good conversations to be happening and I can only hope they act as a spring-board or catalyst for change in people’s aversion to viewing art or going to galleries or galleries/museums to take more risks with what they show, promoting a diversity between the ‘popular’, the ‘outsider’ the new, the old, the controversial, the cerebral, the political, the visual and everything in-between. It is a big ask and comes with high expectations on both sides, but the Arnolfini has the perfect opportunity at the moment as it asks audiences to rewrite its ‘rules’ for its continued ethos going forward [see https://www.arnolfini.org.uk/whatson/new-rules]. You cannot please everyone but everyone wants to be pleased. Or in other words, do not be afraid to show work that people may not like or understand, that is challenging or uncomfortable but assume that everyone who does visit you is there because they want to engage and to have a meaningful experience, so try and give it to them!